Active engagement is an important tenet of instruction and learning — important in both learning and mastering content as well as language. There are many ways to keep students engaged in instruction, including using a variety of activities and discourse, and teaching relevant and interesting content to students. When teaching English learners, it is important to engage them in not only learning academic content, but also academic language, including general academic and domain-specific vocabulary. By adding movement and gestures to academic language instruction, the learning will be more active, more engaging and more comprehensible. Brain research supports the notion of building in kinesthetic learning into instruction. The brain is the largest consumer of oxygen and glucose in the human body. In order to function more efficiently and more effectively, the brain needs oxygen- and glucose-rich blood. Through movement, the heart pumps oxygen- and glucose-rich blood to the brain. Even a simple hand motion will help accomplish this. Additionally, numerous studies in the last decade have shown the connection between movement and learning and how movement can improve memory and retrieval of information, and enhance learner motivation and morale (Jensen, 2005). As Albert Einstein pointed out, "Learning is experience. Everything else is just information." The use of gestures helps to make vocabulary and content concepts more comprehensible for English learners by making the abstract more concrete. Through a simple movement that mimics the content concept or meaning of the word, it becomes easier for the students to understand and internalize content and vocabulary. For example, if students are studying about biomes and the organisms within them, adding gestures to the words biome and habitat helps students to more easily understand the distinction between them. By adding a synonym or short phrase while doing the gesture, the vocabulary word or content concept comes alive and the meaning becomes much clearer to students. Gestures can be developed in a variety of ways. First off, consider what movement would help students to understand the word or concept. The movement created does not have to be complex — a simple movement of the hands or body will suffice. As an alternative, utilize the signs from American Sign Language or the sign language used in the part of the world in which you live. Lastly, consider having students develop gestures themselves. This can be done in pairs or in small groups. Each group can embark on developing gestures for a particular set of words, or each team can develop a gesture for one set of words, and the students can then vote on which gesture or sign they will use for particular words and phrases. This helps to increase buy-in from the students, while developing higher order thinking skills as they determine which gesture will be most effective and comprehensible. Consider the following vocabulary words and the suggested gestures to accompany them. The vocabulary words listed are broken up by grade level and subject area, with sample or potential Language Arts, Mathematics, Science, and Social Studies vocabulary represented. Neither the words, synonym or phrase, or gesture are meant to be absolute. In other words, the vocabulary chosen is representative of the grade-level band, and the verbal synonym or phrase and gestures are samples developed by the author. While this list consists of terminology students will encounter in the subject areas, other words (such as propositions) can also be taught using gestures. Words such as over, under, throughout and around can also be easily taught and understood by English learners through the use of simple gestures and movement. To employ gestures with students, it is important that not only the teacher use the gestures and demonstrate the movements, but also that students practice utilizing the gestures themselves. Have students use the gestures at specific times; introducing the words with the gestures as well as the definition will help students to better understand the meaning of the vocabulary word. Later, as students encounter the word in speech or text, instruct them to show the gesture to demonstrate the meaning of the word in the context of speech or text. 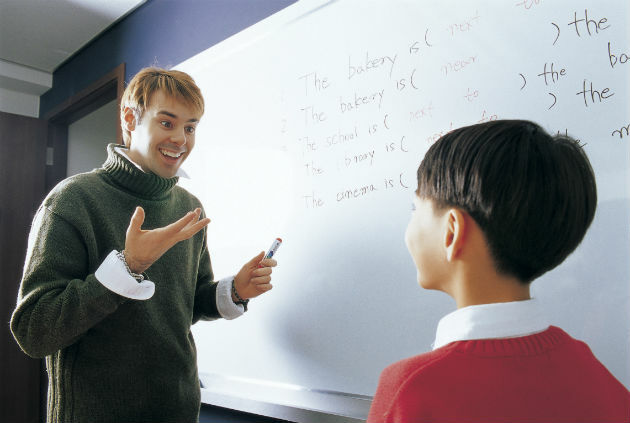 The gestures can also be utilized as a way to review content vocabulary or general academic terms. Students can play a game wherein they quiz each other utilizing the gestures. The teacher can also partake in this game, by demonstrating a gesture and having the students write or say which word it is. Gestures can also be an effective way to manage behaviors in the classroom. For example, gestures can be used to help quiet a noisy classroom. A silent countdown, for example, can be used to indicate that an activity should finish up quickly. Signals can be given for students to clean up materials, to line up or be released from class, or to begin an activity. Similarly, signals can indicate when students are behaving inappropriately or when they need to change their behavior. Long have teachers used "the look" to indicate that something a student is saying or doing is inappropriate. By adding a gesture, using a facial expression is enhanced as it is made more explicit and comprehensible as to what the teacher is expecting. As with all management techniques, it is important that these gestures and signals be kept consistent for students so the students are clear on the expectations of the teacher. The employment of gestures and movement in the classroom are a helpful tool that can more deeply engage students and make content and vocabulary instruction more comprehensible. Utilizing a short phrase or synonym and having the students say the vocabulary word and do the gesture will help them to more deeply embed the word into their receptive and productive language base. Students can also develop these gestures. Remember that the gesture and synonym do not have to be perfect; the simple act of adding movement will be helpful to students. You can of course also elicit their feedback on which gestures help them to more fully understand a word, and then adjust the gestures as needed.